Today we had a fun Hot Wheels play date with some friends to try out all of the awesome toys we received for the Hot Wheels Track Builder Challenge (find out how you can win your own awesome party). 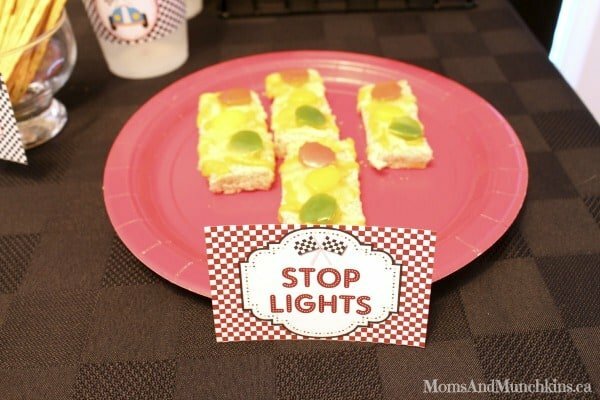 A Hot Wheels party wouldn’t be complete without some fun race car party food! The party was held mid-morning so I wanted light snacks that wouldn’t ruin anyone’s appetite for lunch. My son loves muffins so I knew these had to be on the buffet table. 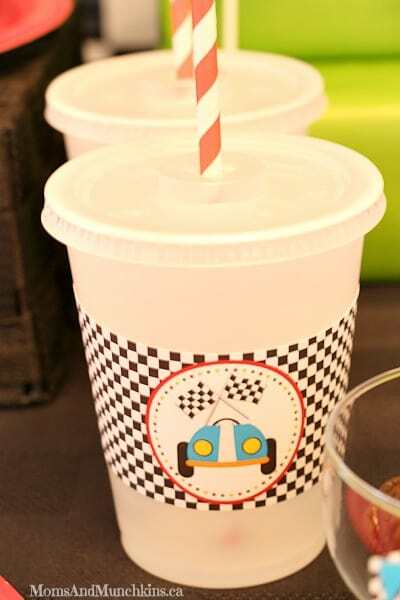 I used printable party supplies from Forever Your Prints to decorate them with race car wrappers and fun toppers. 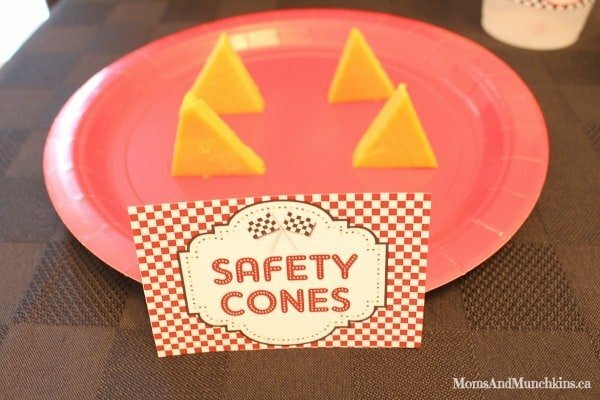 I saw an adorable “safety cones” idea on Pinterest with cheese so we had a little cheese plate as well. 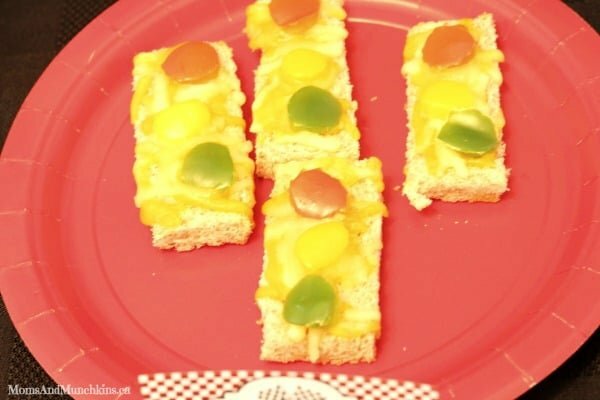 These are so quick and easy to make! 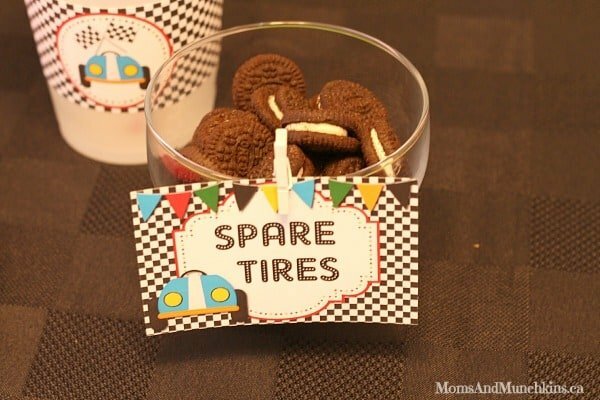 For a sweet treat, I put out some mini Oreo cookies as “spare tires”. The mini ones are the perfect size for little fingers. 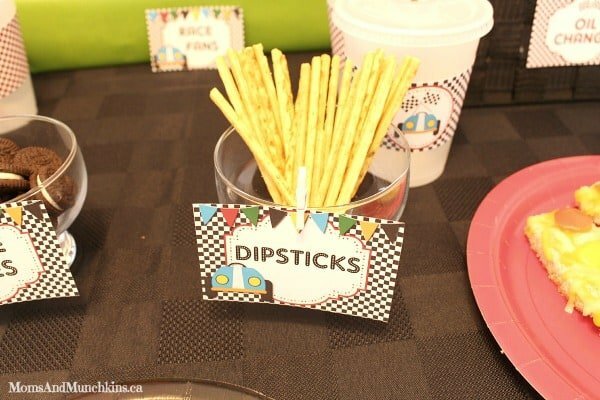 Chocolate pudding was set out in the “oil change” area with pretzel sticks labeled as “dip sticks”. I also made “street light” cheesy bread that turned out really cute. Simply start with bread sliced into rectangle strips. Put some cheese on top – use shredded or sliced cheese. Then cut out little circles of red, green and yellow peppers for the stop lights. Toast them in the oven at 450F for a few minutes (until the cheese melts). 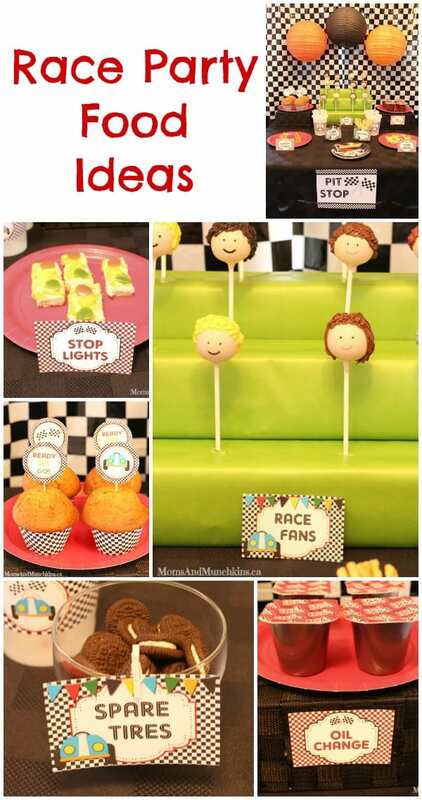 I created some fan bleachers (fan bleacher instructions here) for adorable cake pop race fans. Oh, they are so cute! Almost too cute to eat! 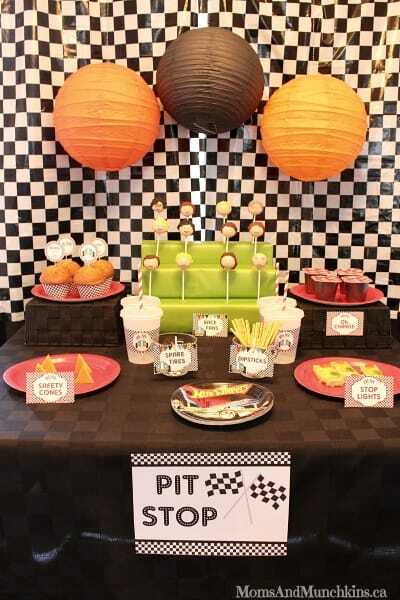 The backdrop for the party was simply a checkered plastic tablecloth with three paper lanterns. I used bottle wraps around clear plastic cups for the drinks. 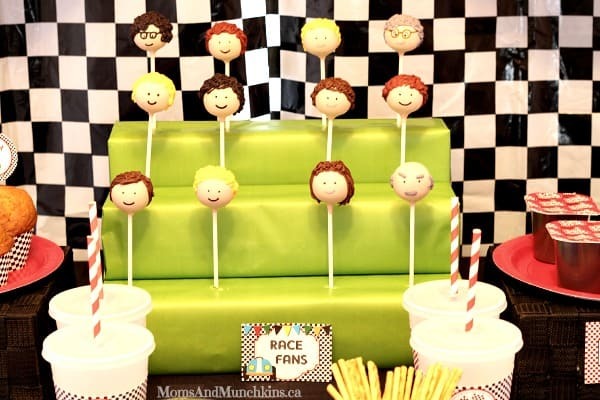 There you have it – simple but delicious race party food ideas! 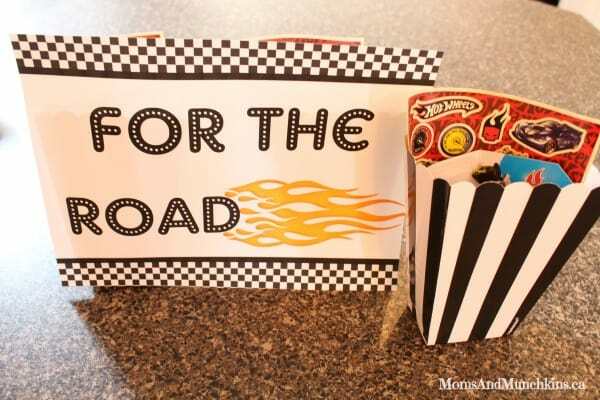 For favors, the kids went home with Hot Wheels cars and stickers. One final idea – race car plates. 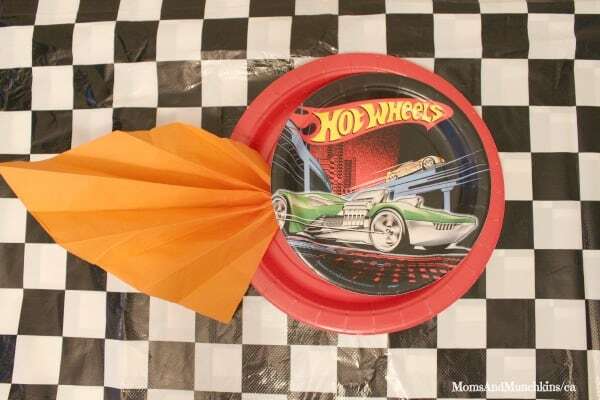 This is such a simple idea: simply accordion fold an orange napkin and place it under the Hot Wheels place to look like flames. So simple & cute! 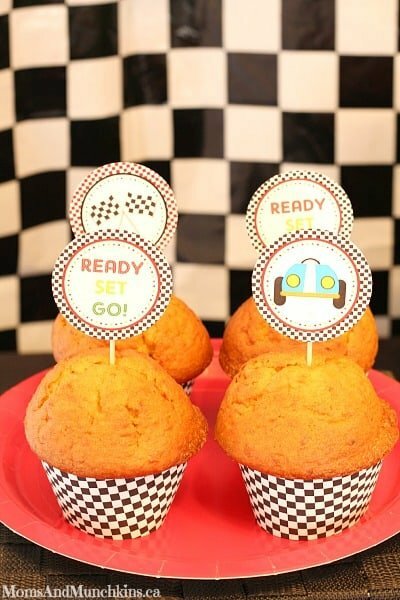 Visit our race party category for even more fun ideas! 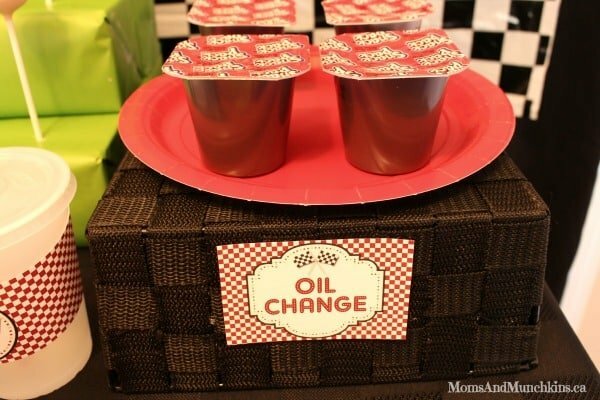 We’re always adding new ideas for themed parties and family fun. Never miss an update by following us on Facebook, Twitter, Pinterest, Google + and Bloglovin’. Stopping by from Creativity Unleashed. The bleacher idea is GREAT! 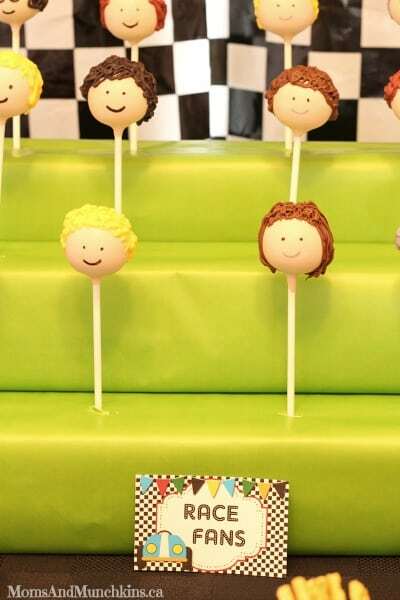 Those pops look like a lot of hard work and detail. Thanks for sharing 🙂 Have a great weekend. Hi how do u make the accordion fan as flames in details. What size napkins did u use?